Let's sweeten up this hump day with some cheery color. I walked passed a lovely lady this week and did a double take on her dress. It wasn't yellow, it wasn't even a buttercup, it was lighter yet sweeter, I decided it was lemon. Lemon is the color today. It's light and sunny but not as saturated as your standard yellow. 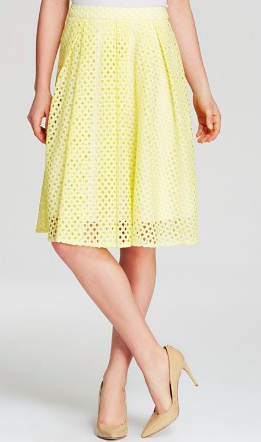 Starting strong with this eyelet beauty. I love the ivory contrast behind the lemon. 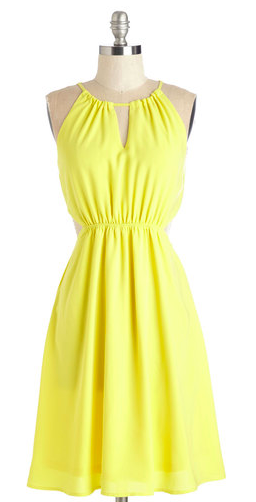 Perfect brunch dress. I love the neckline and the peek-a-boo sides. 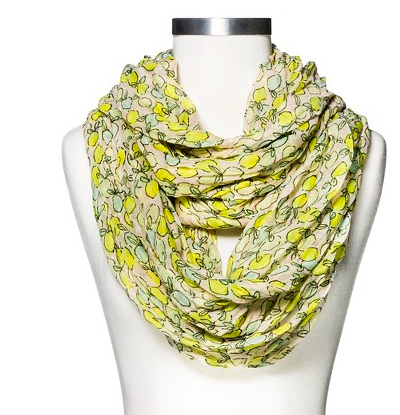 Oh come on, I had to include this sweet lemon print scarf. I'd pair this with a denim jacket for a cooler spring day. 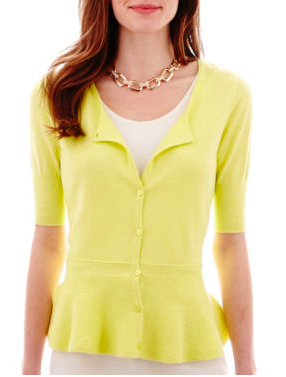 A peplum cardi? Excellent work JCPenny. And the price point is spot on. A beautiful lemon for this midweek post. It's cheery, almost pastel, and it's bound to brighten up your closet.